Hey there! I think we can make it official. 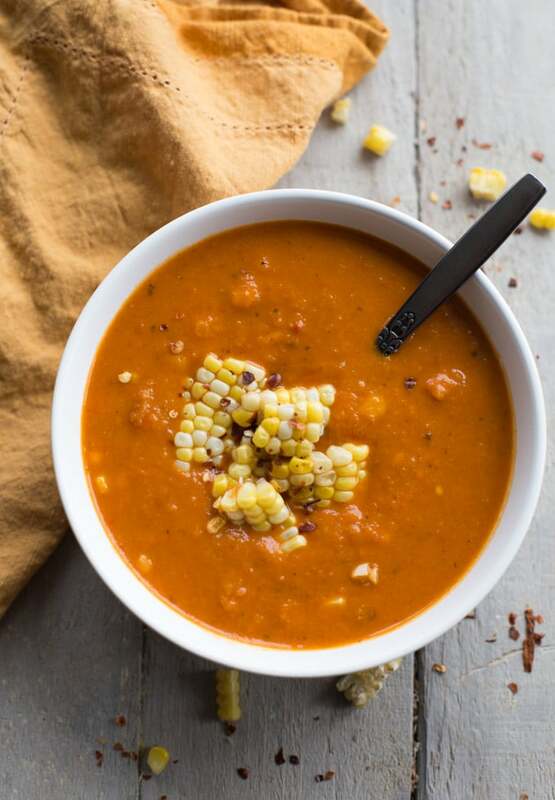 It’s cozy, comfort soup season! 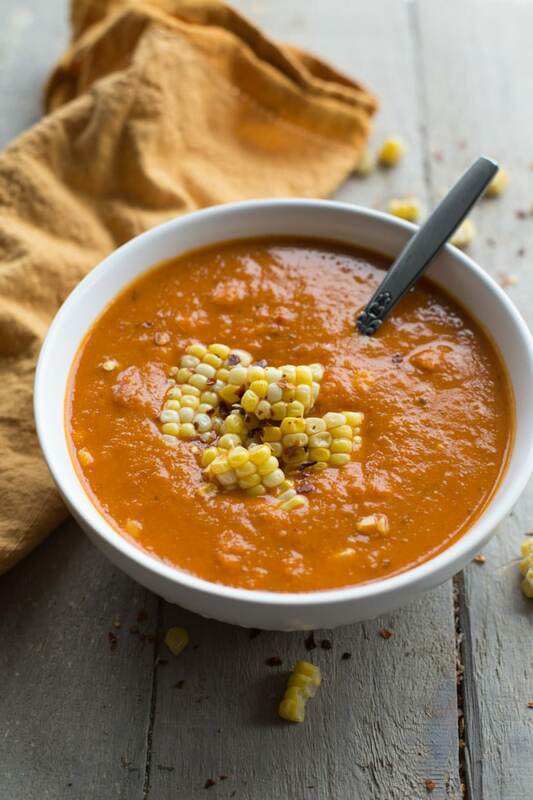 And what better way to celebrate than with this Roasted Red Pepper and Butternut Squash Soup. 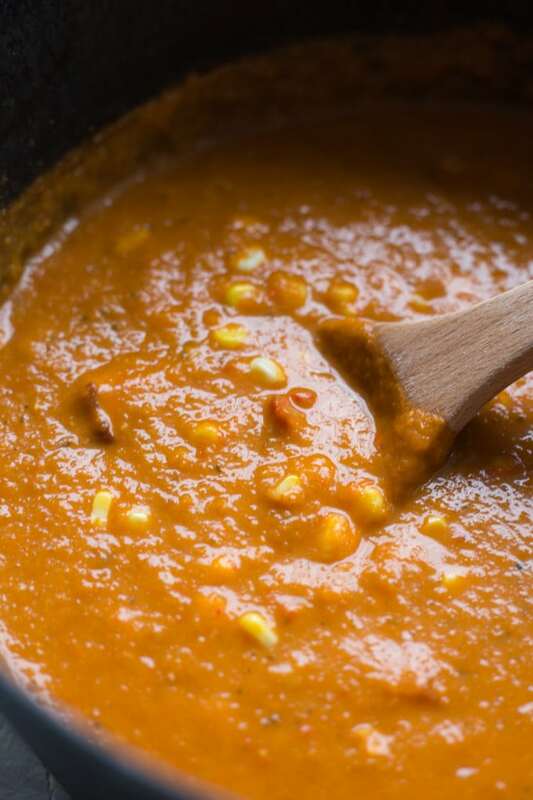 It’s quick, easy and clean eating, and totally my new go-to soup for cold fall evenings! I’m a huge fan of puréed soups, but I know they aren’t for everyone. And I totally get it. When people think of soup, they usually imagine chunky chicken or beef with lots of vegetables swimming around a sea of noodles or rice. At least, that was my view on soup for the longest time. The only “puréed” soup I used to eat was a can of Campbell’s tomato soup. And I had so many crushed up crackers in it, it resembled a chunky soup! 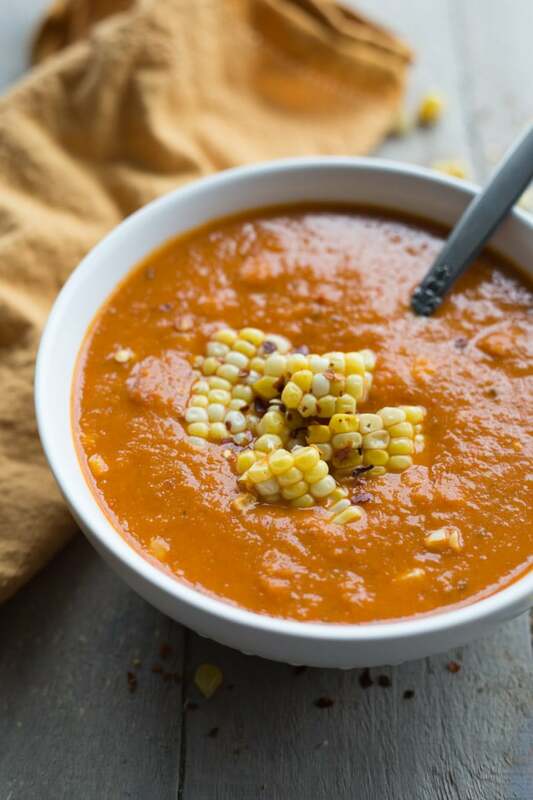 I’m not saying you shouldn’t add crushed up crackers to this Roasted Red Pepper and Butternut Squash Soup, because I totally did! What I am trying to say is that there’s a lot to love about puréed soups. They are thick and creamy, and you can disguise all sorts of healthy vegetables in them 😉 . For many years, I stayed away from making puréed soups because I thought they were too much work. This probably goes back to my first attempt at making a squash soup. You know, mid-20s, throwing a little dinner party and trying to impress my guests with my fancy squash soup 😉 . A soup that I did not think through enough! I remember struggling to peel and chop the squash (I believe it was an acorn squash, which was totally brutal to peel). And I didn’t even own a blender, so I thought I could “blend” up the cooked squash with a potato masher. Why I thought this was a good idea is beyond me. In the end, I think the soup tasted okay, but it was a painful process! Since then, I have two simple rules for making puréed soups: use a blender and buy squash that has already been peeled and chopped! 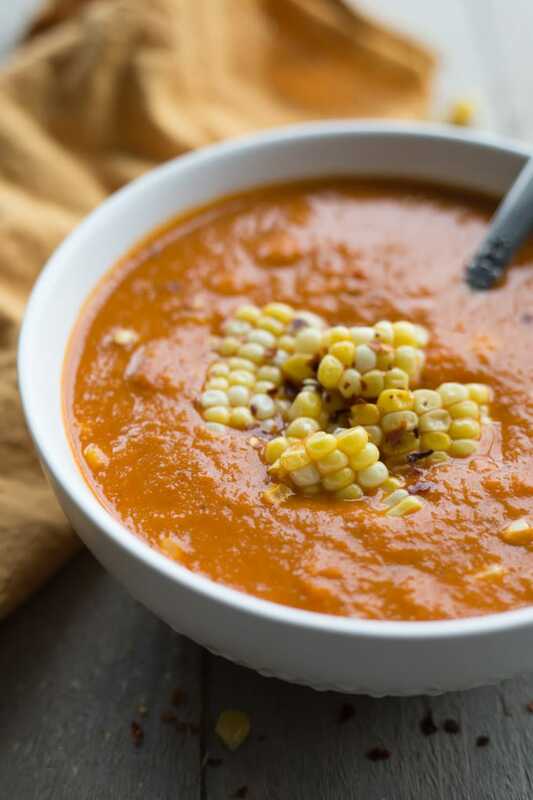 For this Roasted Red Pepper and Butternut Squash Soup, I actually used a diced veggie soup mix that included butternut squash, carrots, onions and leeks. It not only saved me time, but this veggie combo created an awesome flavour for the soup. Of course, I didn’t end there. I paired this mix with two large roasted red pepper (obviously!) as well as roasted garlic, sage, smoked paprika, red pepper flakes, salt and pepper. The smokey, spicy flavour combined with the leeks and onions makes this soup taste amazing! I’ve made two batches in the last week, and I haven’t shared a single bowl with anyone! And for those lovers of a chunky soup, I’ve got you covered. While all the other ingredients are puréed together, I added some roasted corn and diced lean ham to the soup at the end. So you get it all with this soup! It’s thick, creamy and chunky! And did I mention how easy this soup is to make? I just roasted all the veggies on a single baking sheet for 40 minutes and, once cooked, blended them together (minus the corn) with some veggie broth and coconut milk. I added the blended mixture to a pot with the corn and ham and simmered for 20 minutes. And that’s it! Dinner is ready! This soup is perfect for lunches or as an appetizer, but my favourite way to enjoy it is for dinner with this messy tomato jam sandwich. Such a great combo! I’ll be whipping up this soup again on Sunday to have some hearty lunches ready for next week. What will you be doing for your Sunday meal prep? I hope it includes making this soup 😉 . If so, let me know how it goes! 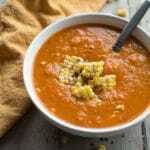 This recipe for Roasted Red Pepper and Butternut Squash Soup is thick and creamy with a smoky, spicy flavor. And it uses ready-to-cook diced butternut squash, carrots, onions and leeks, so it minimizes prep time, making it a quick and easy clean eating soup! Pre-heat the oven to 350 degrees and line a large rimmed baking sheet with parchment paper. Spread out the butternut squash mixture, red pepper, corn, sage and garlic on the baking sheet. Drizzle with olive oil and sprinkle with salt, paprika, red pepper flakes and pepper. Roast for 40 minutes, stirring and rotating the vegetables a few times to ensure they do not burn. Remove from the oven and let cool for a few minutes. Cut the corn kernels from the cob and set aside. Add everything, except the corn, to a blender and blend on high until the veggies are almost puréed. Add the vegetable broth and coconut milk and blend again until the mixture is creamy. Pour the mixture into a medium-sized pot (or dutch oven) and add the corn and ham (you can save a bit of corn for garnish if you like). Cover and let simmer over low heat for 20 minutes. If your blender is not big enough to handle the entire mixture, you can blend the mixture in batches. But I would actually blend the veggies and the coconut milk together, and then just add the vegetable broth to the mixture once it’s in the pot. I added ham to this soup because I had some left from Thanksgiving dinner. If you prefer, you can use cooked chicken or turkey, or forego the protein and make this soup vegetarian! I like a soup that is thick, creamy and chunky! But I also like the pureed ones, and the chunky ones. My only requirement, they have to be vegetarian (or pescetarian). Loreto is the soup maker at home, I know he would love your spice additions: smoked paprika, red pepper flakes, pepper, and sage. Plus, the coconut milk adds a delightful creaminess. We love soup season!! Thanks Nicoletta! I wish it could be soup season year-round! I enjoy the spices as well, and often make this one without ham. Hope you have a great week! It’s still chilly here, and this looks delicious. My family would love this for dinner this week! Thanks Kaitie! It’s a great cold weather soup! I make it all the time. 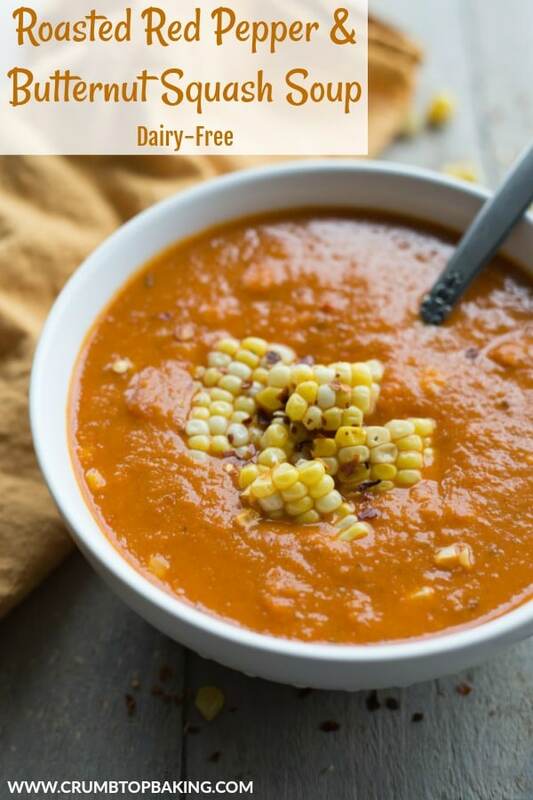 I love both roasted red pepper and butternut squash soups, so I am loving that this combines both together! It makes it extra awesome 😉 . This is perfect for when you are craving a delicious bowl of soup! Thanks Vanessa! It’s been on repeat in my house all winter! Great to make on Sundays and enjoy for lunches during the week.